An international research team led by the University of Michigan Life Sciences Institute is changing the understanding of the key cellular and molecular events that trigger graft-versus-host disease, an often fatal complication of bone marrow transplants. GVHD is caused by newly transplanted immune cells becoming overly aggressive and attacking a patient's organs and tissues. It was long thought that the main driver of GVHD was specialized cells known as antigen-presenting cells, which normally signal the presence of foreign invaders. However, new research conducted in mice found that structural and connective cells in the lymphatic system called stromal cells are major players in priming donated immune cells to attack the host's body. The findings are scheduled for publication March 20 in the Journal of Clinical Investigation. The discovery that these stromal cells drive the aggressive complications of bone marrow transplants opens a new avenue for developing targeted therapeutic approaches, the researchers said. Bone marrow transplants are used to restore a healthy blood system in patients with leukemia and other blood cancers. The transplant's power comes from the ability of the donor cells to find and attack lingering cancer cells in the patient following chemotherapy or radiation treatment—but GVHD develops when the new immune cells attack the transplant recipient, too. A majority of bone marrow transplant recipients develop some level of GVHD, and for a significant minority the condition is fatal or leads to chronic, life-long complications and discomfort. Current strategies for preventing GVHD broadly suppress the patient's new immune system, which also decreases the transplant's effectiveness. 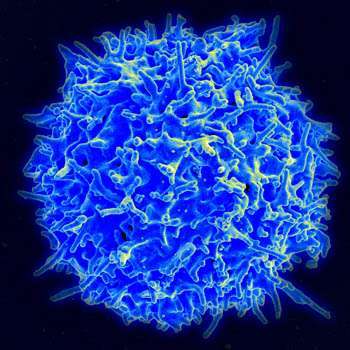 Efforts to be more selective have focused on the signals received by the donated immune cells, especially from a type of specialized cell known as hematopoietic antigen-presenting cells, whose job is to provide information to immune cells about harmful threats. "Our research showed that a type of white blood cell in the transplant, known as T cells, receives critical signals within the first 48 hours that cause them to become aggressively reactive and attack the host's tissues as if they were foreign invaders," said study first author Jooho Chung, a student at the U-M Medical School. "These signals were thought to originate from the specialized antigen-presenting cells, but we were able to demonstrate that they also come from structural, connective cells within the lymphatic system, which includes the spleen and lymph nodes." When the researchers selectively blocked ligands of an important signaling pathway—called the Notch pathway—in stromal cells of secondary lymphoid organs during this critical window, they were able to prevent the development of GVHD in mice. The same protective effects were not seen when the source of these signals was blocked in the specialized antigen-presenting cells. "So, these results reveal a previously unrecognized role for stromal cell niches in generating this aggressive reaction to bone marrow transplants—and give us a new area to potentially target with new treatments," said co-first author Christen Ebens, assistant professor of pediatrics at the University of Minnesota Medical School and former postdoctoral fellow at Michigan. Along with being a researcher, Ebens is also a clinician who treats pediatric cancer patients, including performing bone marrow transplants. Significantly, disrupting the signal during those first 48 hours provided long-term protection against GVHD, said the study's senior author, Ivan Maillard, a hematologist and faculty member at the U-M Life Sciences Institute who directs the leukemia program at the U-M Comprehensive Cancer Center. "Notch is such an important signaling pathway that a long-term blockade wouldn't be possible," Maillard said. "However, if the treatment only needs to last for a few days, it could provide a lot of benefit for patients without problematic adverse effects."